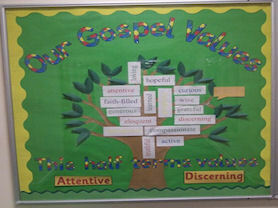 A display on the Gospel Values. 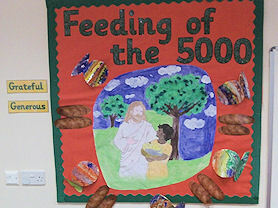 The values which guide and inspire us in our Christian lives are those given to us in the Gospels. They are our Gospel values. "Blessed are the poor in spirit, for theirs is the Kingdom of heaven"
"Blessed are those who hunger and thirst for righteousness, for they shall be satisfied"
"Blessed are the pure in heart, for they will see God"
"Blessed are the peacemakers, for they shall be called children of God"
"Blessed are those who are persecuted for righteousness' sake, for theirs is the kingdom of heaven. Blessed are you when they insult you and persecute you and utter every kind of slander against you because of me. Be glad and rejoice for your reward is great in heaven; they persecuted the prophets before you in the very same way"
Gospel values "...are a guarantee of peace and of collaboration among all citizens in the shared commitment to serving the common good". 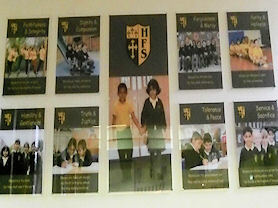 Each half term, the children develop their understanding of two new virtues and strive to apply these to their everyday lives. 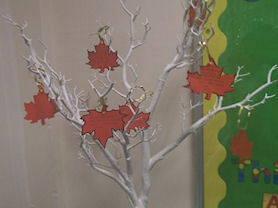 The children have the opportunity to write how they have applied these virtues onto a leaf and display it on our Virtues Tree. At the end of the half term, the leaves are placed onto our larger tree, so that as the year moves on, the children's demonstrations of the Jesuit virtues will fill its branches. 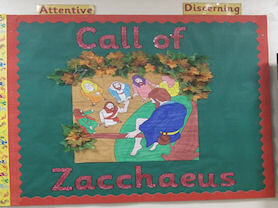 Also, each half term, a new display is put up which depicts a bible story that ties in with the virtues the children are focusing on.